I came up with the topic of ‘Dry Contacts’ for this email when I was replacing an instantaneous water heater with a Combi-Boiler last week. The boiler manufacturer in this case has low voltage terminals to engage the call for heat, and high voltage terminals to engage system pumps. But the manufacturer requires that the installer use field installed ‘dry contacts’ to engage those terminals when energizing the heating cycle. So, the question is, what are ‘dry contacts’? Dry contacts have a power source going through them that is independent of the control circuit. It’s like a contactor or relay. You have your control voltage that controls when the the contactor or relay coil is energized, and you have the dry contacts that the coil causes to close because of the action of the coil. So, when the coil closes the dry contacts a load voltage runs through those dry contacts to energize a motor, valve, compressor, or otherwise. Again, the control voltage that energizes the coil on the relay is independent or separate of the load voltage that actually energizes the equipment. 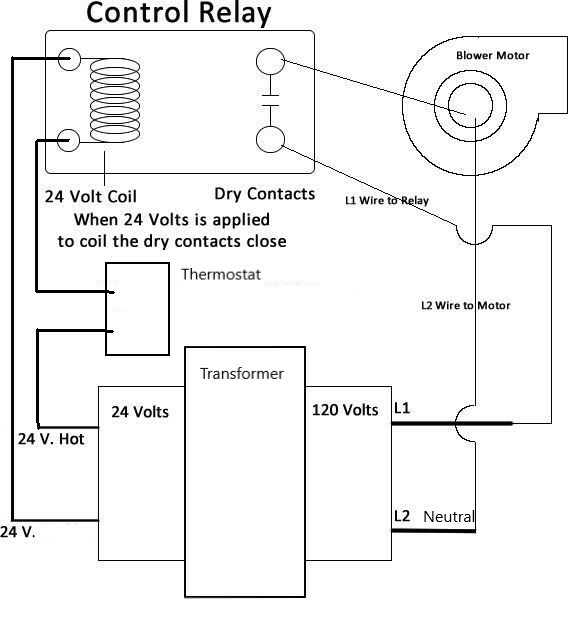 A contactor in an A/C condensor has a 24v coil and a set of dry contacts. When the coil is energized from the furnace or air handler (as indicated by the control signal in the image) it closes the contacts which are wired independent of the 24v that energized the coil. Now one of the screw terminals on the dry contacts will have the line voltage (as indicated by the image), which in this case is 120v. And when the coil closes the dry contacts the voltage is carried through to the other terminal (which is the load terminal indicated by the image), and energizes the compressor. It’s a switch that turns on equipment, but the switch is controlled by another voltage source. 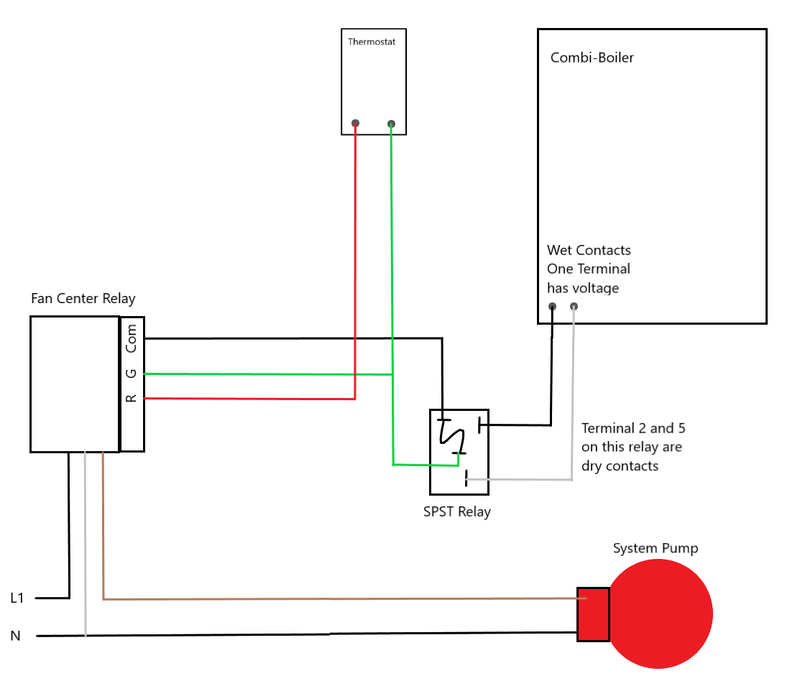 Another example of what I am trying to say is found in this drawing of a relay that powers up a blower. Is there such a thing as ‘wet’ contacts? Yes, but they aren’t normally referred to as being ‘wet’. Wet just means that the contacts indicated on that equipment have power. Wet contacts are typically powered by the boiler (or other unit) to energize field installed controls and equipment such as thermostats, motors, pumps. Wet contacts can be ‘hot’ all the time, or energized by the unit when required. Most High limit controls, most Fan limit controls, most pressure switches have control voltage running to them and then through them. Thermostats are wet contacts. They get their power from the circuit board and it directly influences the activity of the circuit. From the ‘R’ terminal on the board, up to the ‘R’ terminal on the thermostat, to the ‘W’ terminal on the thermostat, and back to the board to call for heat. Wet contacts are powered contacts that directly power the equipment. The manufacturer for this boiler on this particular job uses ‘wet’ contacts, but they don’t want us use their low voltage and high voltage wet contacts to directly energize the thermostat circuit or the relay circuit for the system pumps. They fear the additional field wiring will be too taxing on their circuit board. So they decided it was a better idea to have the voltage they supply from their circuit board run through field installed dry contacts for both the low voltage (for thermostats and such) and for their high voltage contacts (for pumps and motors and such). The image above is how I wired the system. On this job there was an existing Fan Center Relay that energized the system pumps and provides the 24 volts for the thermostat circuit. Just in case you don’t know, the relay in the Fan Center has a normally closed contact and a normally open contact. The normally open contact is the dry contact that I used for the 120v pumps. So, one side of the contact is fed 120v, and when it closes it travels through the terminals to energize the pumps. That contact closes when the ‘G’ terminal is energized. So, I left the pump circuit wired through the Fan Center Relay and added a SPST 24v relay for the low voltage (thermostat) call for heat circuit. I used terminals 2 and 4 on the relay as the dry contacts the manufacturer requires to energize the call for heat. So the Fan Center Relay becomes my dry contacts to energize the system pump, and the new SPST relay I now installed becomes the dry contacts for the low voltage call for heat circuit. As you can see by the diagram above, I made sure the thermostat circuit energized both the ‘G’ terminal on the Fan Center Relay (FCR) as well as the coil on the SPST Relay I mounted on the wall. The dry contacts on the SPST Relay complete the circuit in the boiler to call for heat and the dry contacts in the FCR energize the system pump. The dry contacts, in essence, become the thermostat for the boiler. Now remember, wet contacts means the equipment supplies the power. So, a possible application for wet contacts in a boiler might be a set of terminals to run a circ. pump for the DHW storage tank. The boiler control will energize that terminal when the Aquastat calls for heat. If there are 2 terminals in that circuit, one will be the Hot, and the other may be the Neutral for the pump. Either way, the manufacturer runs the low voltage load (thermostats, aquastats), and/or the high voltage load (pumps, motors) right from the boiler. That is what wet contacts typically do. Alternatively, some manufactures use dry contacts in their terminal strips. Again, the manufacturer does not provide power to dry contacts, you have to provide the power to the terminals for your load. A boiler example is when there is a low voltage signal for space heat, the circuit board on the boiler might close a set of dry contacts on the terminal strip that will be rated for 3 amps at 120v. So, you apply 120v to one terminal and you can wire the other terminal to the pump. (Be sure the neutral side of the pump is wired to the boiler as well). When the call for heat is terminated, the circuit board will open the contacts shutting down the pump. So, when you find yourself navigating a boiler wiring project, you need to read the instructions carefully to identify what terminals are ‘dry’ and what terminals are ‘wet’ and how they want them wired!